In an attempt to snaffle the legions of ex-HTC Desire users with a more budget model, HTC has announced the Desire X. The phone itself is unremarkable when it comes to specs, with a dual-core 1GHz Snapdragon S4 processor powering a Super LCD screen that measures a now-average 4-inches. This has also been raised up and laminated to help cut down on the glare when looking at the screen and improve clarity, which seems to have worked given the impressive display on offer. It’s more ‘smartphone’ than the ‘superphone’ One series, according to Graham Wheeler, director of product commercialisation for HTC, but still manages to pull in design language from a number of models in the company’s history. 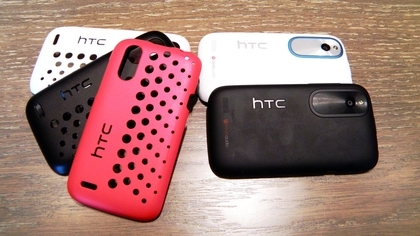 The shell feels very similar to the polycarbonate of the HTC One X, but instead of a unibody chassis we’re treated to a removable back cover that hides slots for a normal-sized SIM and a microSD card too. 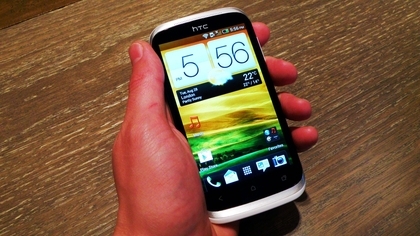 In the hand the HTC Desire X is much more palm friendly, fitting snugly between the digits and offering a more unique central power/lock button. This initially seems like a weird place to put such a key point, but within seconds we realised it fitted in with the design very well. The rest of phone also offers relatively little to talk about – there’s a microUSB slot and a headphone jack at the top, along with the Android Ice Cream Sandwich-friendly three soft keys at the bottom of the device. 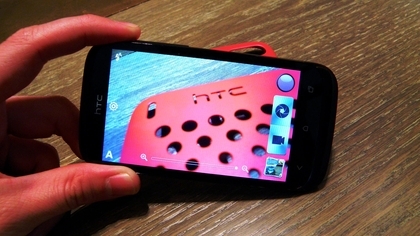 The camera is the most striking part of the HTC Desire X though – not through its specs (only 5MP on offer here) but the design direction. It evokes the Evo 3D language from a year ago, but fits more slickly into the architecture of the device. It’s definitely the most unique feature of the phone, thanks to the blue band (on the white version of the Desire X, although an all-black option is also available) and will likely play a strong part in the marketing of the device. There’s also a range of covers to choose from, in the same way as the One X was able to be ‘styled’ to your own preference, although these added a fair bit of heft to the slim device. 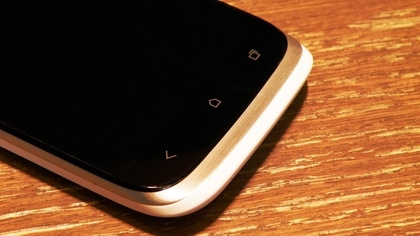 The software onboard the HTC Desire X is Android Ice Cream Sandwich, coming in at 4.0.4 (although a Jelly Bean update isn not confirmed as yet). This is running underneath HTC’s famous Sense UI, which is thankfully pushed all the way up to Sense 4.0. For those untrained in the Sense evolution, when it first debuted it was a revelation for Android, bringing a whole new skin that offered a raft of new functionality that wasn’t available from Google’s vanilla option. However, over time it became slightly more bloated and power-intensive, focusing too much on the functionality to the detriment of performance and battery life. With the One Series of smart/superphones, HTC has dialled things down, and it’s great to see that simplicity on the Desire X too. It’s not the full version of Sense, more a tweaked version that takes away things like the re-designed multi-tasking window. Where before we saw large thumbnails cascading across the screen that could be removed by swiping upwards, we now see the standard Google list layout, although this is no less functional. 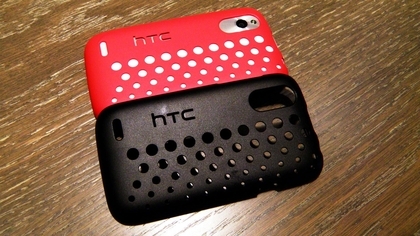 There’s the same rash of HTC toys throughout the phone – from the Music Hub, which brings together the likes of SoundHound, 7Digital and the Music Player (enhanced by Beats Audio) to the camera. It’s not the same ‘amazing experience’ as touted by HTC for the One Series, but still features a lot of the impressive features seen on that range. For instance, there’s the same pre-shot effects that can make the photo look more ‘alternative’, and the burst mode (engaged by holding down the shutter key) and still works as well as on other phones. The processor, a 1GHz dual core offering, might not sound like much in today’s world, but given we’re talking about a company that made the HTC Desire a slick phone on a single core, and the fact it’s rocking a Qualcomm S4 chip, we can see why this is a lag free experience under the finger. 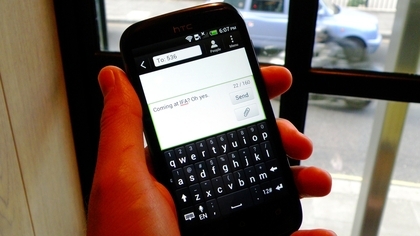 Websites load with the expected aplomb, opening and closing apps is a slick enough experience and the messaging system is adequate enough, although the days where we looked at the HTC keyboard as the best in the business are sadly gone as this one still brought out a little lag, and the accuracy isn’t as gifted as it once was. 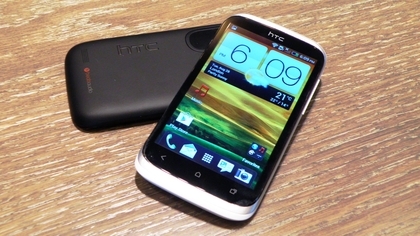 It’s worth noting that this is a pre-production model though, so we’ll reserve judgement until our full HTC Desire X review. Other niceties include 25GB of onboard storage with Dropbox, which HTC says helps make up for the fact there’s only 4GB included on the phone, and precision-drilled speaker grills for that added sense of craftsmanship. Let’s get onto the important thing: price. 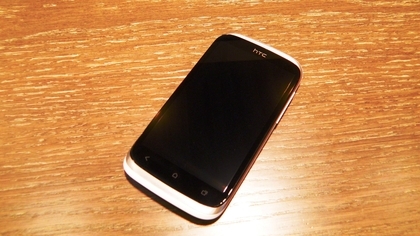 This phone is set to sit above the Desire C, but below the HTC One V, in the range of products from the Taiwanese manufacturer. And while we predictably couldn’t get HTC to confirm it, the Desire X could come in for just £15-£20 a month on contract, or £180-£200 on pay as you go deals. This would be a real howitzer of a handset to throw at that segment, as while the HTC name doesn’t command the same level of fervour among smartphone users, those wanting to stick with the Desire name will love the idea of halving their bills. 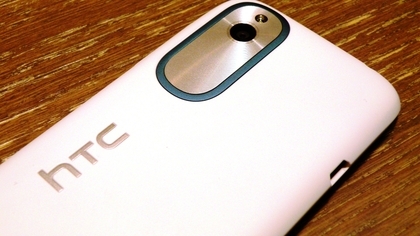 The HTC Desire X release date is set for mid-September in the UK, so it won’t be long before we get to update this hands on with a full, in-depth review of a possible mid-range marvel.